Disney has announced it will produce a sequel to its runaway hit Frozen, which last year became the highest-grossing animated film of all time. The Oscar-winning picture made $1.27bn (£857m) at box offices worldwide, and led to record sales of related merchandise. Frozen 2 will reunite the team behind the original feature, including director Chris Buck, writer Jennifer Lee and producer Peter Del Vecho. The studio did not name a release date. Shares in parent company Walt Disney were up by almost 4% following the news. Toy-maker Mattel, which currently owns the license to sell Frozen products, saw its shares rise by almost 5%. 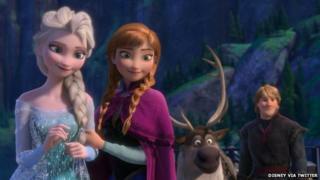 Last month, Disney credited the continuing success of toys based on Frozen for an "incredibly strong quarter". Net income rose 19% to $2.2bn (£1.5bn) in the three-month period, with revenues up 9% to $13.4bn - both figures better than forecast. In December, Frozen became iTunes' biggest-selling movie of all time, while the soundtrack sold more than any other album in the US in 2014. Additionally, DVD and Blu-ray sales of the animation broke the three million mark on the first day of their release.